Downend Round Table Fireworks is a hugely popular event, typically attracting over 10,000 visitors on site. If you live within a twenty minute walk we recommend that you don’t drive directly to the event, it’s quicker to walk! There are three main gates on the site, all of which take cash, e-tickets and advanced tickets. When approaching the site please follow the marshal’s instructions who may direct you towards an alternative gate. 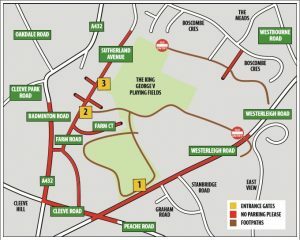 Walk along Peache Road until the double mini roundabouts with Westerleigh Road. Turn right and you’ll find the entrance 100 metres down on the right hand side. Walk along Badminton Road, past Mezze (at the Green Dragon) and turn right into Cleeve Lodge Road. Turn immediately left into Farm Road. Follow this road until it turns into Sutherland Avenue. 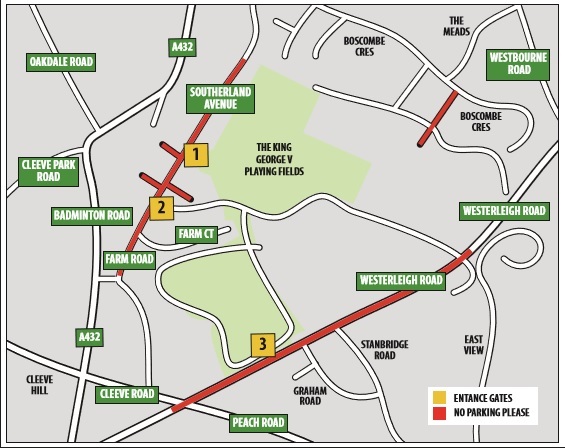 Head towards Westbourne Road from either direction, pick up signs Boscombe Crescent until you reach Sutherland Avenue (nearest Badminton Road end). Follow Sutherland Avenue for 300 metres and gate three will be on your left. If you are travelling by car. Peak traffic times are between 1830 and 1900. There is limited parking behind the Willows shopping centre in Downend. Unfortunately due to the number of members of the public accessing the site and limited space there is no disabled parking available on-site. If dropping off a disabled guest we would advise using Gate 3 on Sutherland Avenue which proves easy access to site initially across hardstanding before heading up onto a level football pitch.